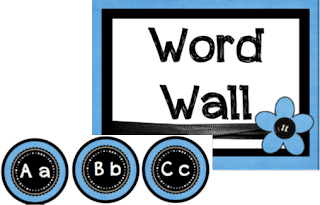 Classroom photos and Word Wall Freebies! - The Resourceful Room! I am so excited I finally got to go into my classroom today!!! I love the principal and assistant principal they were so nice and welcoming! I met a few teachers who all told me how great their school was and I got to do a little work! Here are some before pics. Standing in doorway - furniture moved and a bulletin board is up! Close up of board, I pitfall of the plastic table cloth is the wrinkles and air bubbles, I worked hard to get them out but think it will be better once I get something on it! From back corner looking out, you can see the board behind my desk for my important papers to go on! Reading area is coming together, that's two file cabinets pushed together with a small board on top, I am going to put my crate seat right under that! second board above reading area, I love the colors and double border! Close up of the board behind my desk! Again, loving the colors!!! Two table clothes made two really large boards and 2 smaller boards! I need to head to the store to get another one or two tonight, and I need more pink boarder! I hope to have more pictures for you this weekend, I'll be working hard to get it all done before I report to new teacher orientation for three whole days next week!! I plan on using the large board above the counter as the word wall, I've got my letters printed and ready to go, I shared the pink and green ones a while back, and have had some requests for sets matching my other freebies I've been sharing so here are a few I've gotten done! Can't wait to see all these sets in some of your classrooms, I know mine is making me so happy!! I do ask if you use these, or create something else based on this design that you please link back to me. I don't mind you making modifications but I've seen a few sets that have been minimally modified and reposted without any credit given. I haven't asked for any money, but I did take a lot of time and care to create them. I love sharing them it just kinda gets me down when I see something I worked so hard on with a couple words changed and posted as someone else work!! Thanks for understanding!! As always I love feedback and comments!! Happy Thursday Everyone!! 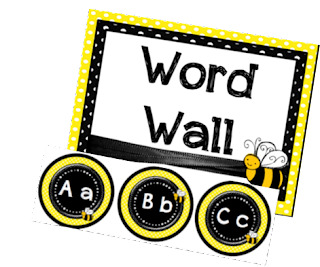 I love the word wall freebies! I wish I didn't already print, laminate, and cut mine. Darn! Your room is going to be great. . . AND. . . . YOU. . . HAVE. . . A . . SINK!!! I'm so jealous! I don't have a sink, and boy, could I use a sink! What grade or subject did you end up getting a job for? I don't remember reading that. Good luck! Read my post to see the progress that I am making! Thanks Patty, I am teaching 4-6th special education, so I'll only have small groups in the room at a time so it should be perfect!! Can't wait to see how it's going for you! Your room is coming together and looking great! Thank you so much for the freebies!! Good luck with your new classroom! I love your binder covers and calendars too! For some reason, it looks as if the last column of letters don't have the polka dots around them... Thanks for sharing your hard work! Sometimes they don't show up but they will when you download or print them. So cute! Thank you for the freebies! Hooray for getting into your new classroom! You will make it look amazing, I know! Yay for classroom pictures. 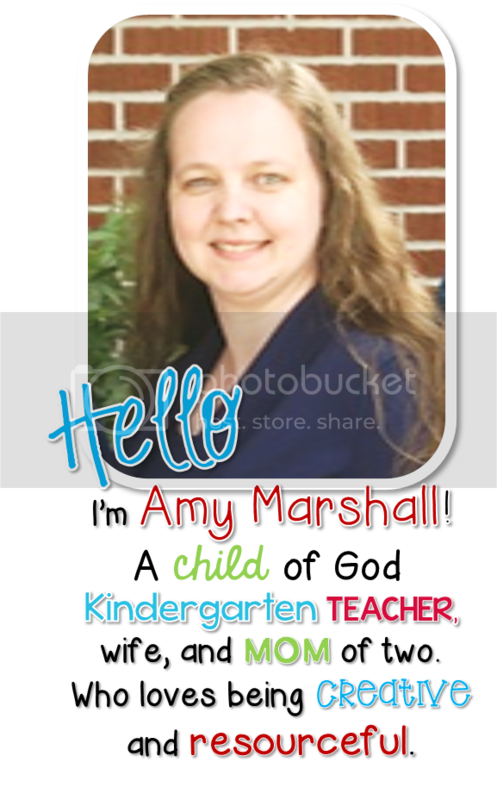 Come link up to my Before and After Classroom pictures linky. It's also a giveaway. Your room is coming along nicely! I can't wait to get into my new room! 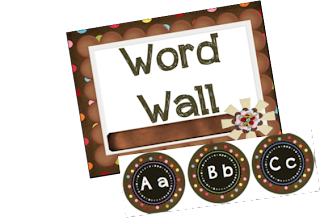 Thank you for sharing the word wall items, love the colors... now I have to choose! Thank you soooooo much for sharing these Amy! I truly appreciate your hard work and that you are sharing these for free! You are so sweet! I love them! The room is looking good! You will have to post photos when you have it all put together. Really appreciate your hard work. Thanks so much. I'm sorry that some have taken advantage of your work. You mentioned that the plastic has wrinkles and air bubbles. Have you ever tried fabric for your bulletin boards instead of the plastic??? I look for fabric that is low cost (anywhere from $1.00 to $2.50 per yard). My boards are 8 feet long so I need just under 3 yards per board. I choose fabric that is either solid or minimal in print. I want it to highlight the student work posted on it, not have the fabric compete with it. The fabric lasts for years and years and I get so many positive comments from others. Again, thanks a million for sharing with us!!! Like Mrs. Yazzie said fabric is great and it saves LOOOOADS of time...you just change borders if you choose. I actually use felt...black felt...from my school. It's fabric..and FREE! That may be another idea to check out too. Love all your work and ideas!!! How do you get the plastic to stick to the walls? You are AWESOME! I have found a lot of cute word wall sets this summer, but yours totally match my new color scheme. I can't wait to use them in my classroom! Glad I was procrastinating this afternoon and checking out blogs! Thanks so much for the bts freebie. 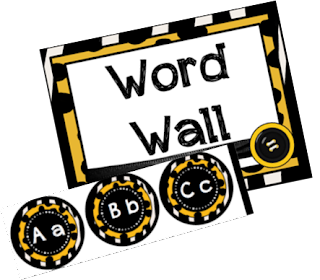 I love your word wall graphics!!! Awesome! LOVE LOVE LOVE your items and you've given me some great ideas. 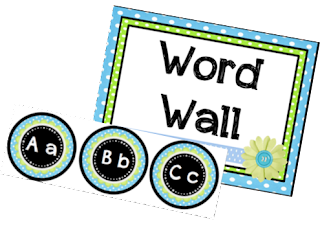 Do you have the schedule/word wall letters in a lavender/green or purple/green? Looks like you have a great space! I know how anxious you must have been to get in there and get busy. We have been "kicked out" of our school all summer because of construction. Hopefully we will be in soon! Thank you so much! You are AWESOME!! I love the daily 5/cafe and word wall letters. Is there a way to change the black to brown in the blue/green sets? Thank you so much for your wonderful creations! 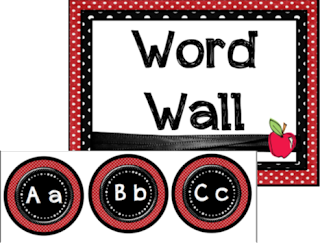 Your red,black and white word wall circles are awesome! I would love a copy. When I download the last letter on each page is white? Is it supposed to be that way? They are awesome! You did such a nice job! Thank you for this freebie. Every little bit of kindness goes a long way.